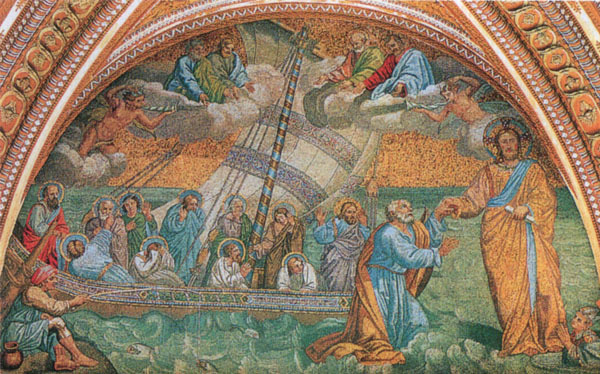 In a lunette over the central opening into the portico is Giotto's heavily restored mosaic, the Navicella, or St. Peter walking on the Sea of Galilee. 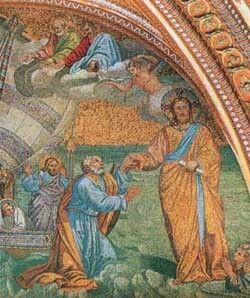 The Navicella was re-affixed in its present situation by command of Pope Paul V.
The mosaic representing the "Navicella della Chiesa," commissioned by Cardinal Giacomo Stefaneschi to Giotto in 1298 for the Jubilee of 1300, is located above the main entrance of the portico. Originally rectangular, it was located in the four-sided portico of the Old Basilica, and only after four unfortunate transfers and various dismantling, recomposition and restoration activities, it was placed in its current location on the occasion of the Holy Year of 1675. At the present time, except for a few details (the gilded edge of the ship, the sail blown by the wind, various sections of some apostles) it must -alas!- be considered as a reconstruction from the 17th century (the last radical restoration was by Marcello Provenzale) of the old masterpiece, which was also praised by Vasari. 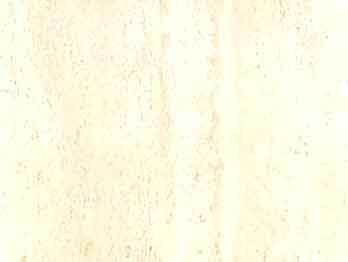 The symbolic representation is inspired by the words of Jesus Christ, comparing the Church to a ship that is constantly battered by storms, by its numerous oppositions, but which will never sink because it can always rely on the help of its founder, depicted by the majestic figure standing on the stormy waves, with his right hand extended toward a kneeling St. Peter, while a very small figure of the cardinal who commissioned the work can be seen in the lower right corner.